So HO scale is 18.7mm or 1/87 (don't ask me, I didn't invent it) but there will be a lot of terrain around from train models. They also put the original 80s version back in shops if you're interested. Love the 80s color scheme, and die cut counters! Everyone loves die cut counters! As I never got my original 80s copy back from a mate.....shut up and take my money! Looks like quite a few HO scale cars out there, although Hot Wheels / Matchbox isn't one of them..
Ah, high school. Can you ever go back? Yeeeeeess. This sounds good; slightly smaller than Hot Wheels cars, but better than the old counter system. I've been trying to do some work to make an "X-Wing" version of Car Wars, but this may do all the work for me. I feel the same way. I played a lot of Car Wars back in the day. Part of me is wary of the changes they look to be making. The other part realizes that there is almost no way the old style of game would work in today’s market. I’d spent a large portion of the week tweaking car designs, and then play all weekend. Not sure if kids these days are up for that. I know I’m not. I backed the OGRE kickstarter out of SJG nostalgia. But that at least is a game that can be slapped down and played quickly. As much as I’d love to revisit the halcyon days of my youth, I think I’m going to let Car Wars pass me by. I don’t know if a quick and streamlined game would connect to my high school memories. 1:87, in case anyone was wondering. Classic European model railroad scale, you should be able to find literally thousands of different cars in the scale, as well as enough terrain to model whole continents. Yeah. I dunno about this. I get that people today have the attention span of a fething fruit fly. But personally I feel like the tinkering that went on with building your car in the original game was one of the real hooks, and part of what made it feel...automotive. Now gameplay, on the other hand, had loads of room for cleanup and simplification. I doubt anyone other than the biggest diehards will be bothered by changes there as long as the system is good. My teenage years have come calling! Bam, purchased the classic set. Now I just need an Uncle Albert's Catalog from Hell for all the construction stuff. Bam! They had that too! I still have my original Uncle Albert's Auto and Gunnery Shop Catalog From Hell and tons of other CW stuff in a box waiting. I picked ADQ up at the FLGS. I’ve still got a shelf full of stuff, dating back to pocket boxes. I wonder how the car scale will fit with the really great stuff put out for Devil's Run. I have no idea where my actual Car Wars stuff is, but I was going through a box a couple months ago that had all the travel guides they put out for GURPS Car Wars, so I'm set for background material. Was "Drive Aggressively" the tagline for Car Wars in the UK? In the US it was "Drive Offensively". It needs redesigned game mechanics, but I've always loved the concept. I think you're right, I was going off of memory from 198X. Whoa, car wars! Used to play that A LOT back in junior high, around '92-'93. We built a big arena and cars in wood shop class, the teacher had no clue of what we were doing. I remember the turning mechanics with the angles and sliding and skidding, that was awesome. Would be great fun to play it again. I won't miss the car design phase of the game. Our group lost interest in the game as, one friend put it "Two hours of car design for five seconds of (in-game) game time". Long time ago, I put a lot of work into an (MS Access) database to help with building cars. The amount of options was overwhelming and frankly, a drag on the game. Being able to simply plop a few cars down and fight will be a welcome change. A little bit of customization to a mostly preset base, would to me, be the best configuration of this game. I played tons of Car Wars at university, I enjoyed both building the cars and the game-play. I've still goy my pocket game box and Boat Wars too. I realise that not everyone likes the more complex and involved kind of game. That said, I also played tons of Blue Max, which is a cleverly simplified WW1 dogfighting game. I suppose something about a game grabs me and I don't care if it's simple or complicated to play. Given that I was satisfied with the original Car Wars, I suspect the revised version may not appeal, but I will reserve judgement until I get a chance to read the rules. I have never heard of "Drive Aggressively" being used as the Car Wars tagline in the U.K. Can anyone provide additional information on this subject? 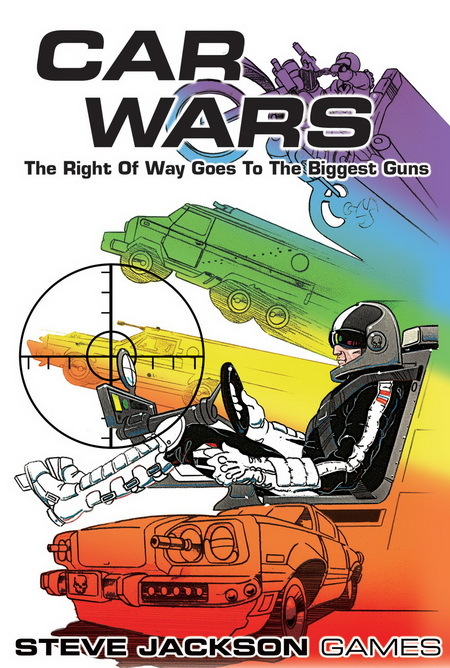 The Car Wars tagline, "Drive Offensively," was mentioned in the short story, "Why Johnny Can't Speed," a story that was printed in the anthology book, "With Friends Like These . . . " written by Alan Dean Foster (first printed in November 1978 by Del Rey). I read about an effort to create a motion picture of "Why Johnny Can't Speed" several years ago, but the project was canceled. My Web site has an archived copy of Burning Rubber, a gamer-created Interstate '76 tabletop RPG. The game was created over 15 years ago. There was also an effort to create an Interstate '76 motion picture, but the project was also canceled. 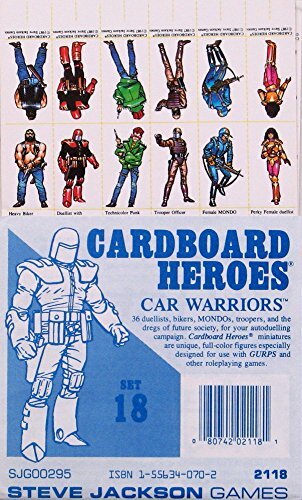 fyi, the SJG website has the original Cardboard Heroes: Car Wars in electronic format for $5. From what information we have thus far, it sounds like the design goals are solid. The (non - collectable) card based car design sounds like it will make that element of the game simple, though hopefully not simplistic. Products will come with pre-made sets of cards, but you can mix and match the cards yourself to make new designs. The dice pool mechanic also sounds like it will foster speedy play. Any word on the Anthology Kickstarter ? The video said it was slated for November, and we are half way through November. The $20 price point for the two smaller starter sets, and the 3 car Faction Expansion sets is awesome. That's basically impulse buy range. I wouldn't feel guilty dropping $20 a week on the game if it's good, getting new rules and models each time, until I basically had them all. HO scale was another brilliant move. Different than matchbox sized and a world of Model Railroad terrain and people available for people that want to have detailed gaming tables. I sat down with Scott Haring yesterday to give the latest draft of the Car Wars game a shot. Scott has been working on the sixth edition rules for over a year now. I've already played the game a few times now, this time I wanted to publicly share a handful of my thoughts on the session. NOTE: All of the components shown in the photos are Scott's very rough test pieces. Also, this is not a detailed, and complete overview of the current playtest set. This is a quick overview to give you an idea of where things are headed. tl;dr - Faster and focused more on speed and destruction than on physics and math. Yay!!! For the session, Scott and I each started with identical game components. We each had a nine-card deck for setting our speed each round. We each had a second deck of vehicle component cards. We each had a record sheet. And we each had a car counter. Shared components during the game were the dice and the new maneuvering tool . . . more on those later. Numbered zero to six, plus a minus one and minus two, these cards were used at the start of each turn to declare our speed that round. Basic vehicles may accelerate or decelerate by one each round; special vehicle component cards can modify that amount. I started at a 6 (the fastest possible speed in the basic game) . . . but I was soon traveling in reverse. In the older editions of Car Wars, vehicle design was an exercise in mathiness as we calculated weight, space, cost, and did our best to cram everything into a car that we loved. Yesterday, during the sixth edition playtest, all I had to care about was a single number: Ten. Each of the vehicle component cards has a number in the lower left corner and as long as all of my cards totaled ten then I was ready to go. Now some sessions will use a different number -- say "20" as one example -- but for our game, Scott and I were each limited to ten. Armor, engines, tires, and other stock components. Part of what made vehicle design so quick was that each car automatically started with some basic -- and vital! -- components. Scott and I each had the same baseline vehicle with 30 points of armor, basic tires, a driver and gunner, and an engine. We could modify those basics with the vehicle component cards -- Scott, for example, increased his armor total to 45 -- but every modification counted toward the target number of 10. Starting with the basic shell of the vehicle reminded me a lot of an old Autoduel Quarterly article and of the original card-driven vehicle design system we tested during the fifth edition playtests. Scott improved on that older work, and the result left me happy with the ease and speed of the system. Within five minutes, we were each ready for combat. * Dice. There are two different types of dice in the Car Wars sixth edition game, basic play dice and special collision dice. The basic dice are for initiative, combat, control rolls, and just about anything else you'll ever want to do. When attacking you roll and hope for "hits" while your opponent rolls and hopes for "shields." When maneuvering you do not want to roll "skids" or else you will, as Scott put it, be the "proud owner of an out of control token." I don't think Scott knows the meaning of the word proud. The collision dice only come into play when you ram something -- which I did -- and are rolled together. One determines distance your car moves from the point of impact while the other shows your car's orientation after a collision. Extremely simple, and highly effective when my speed six car slammed head-on into Scott's speed five car. * Maneuvery tooly thingy. Hey, we're working on the name! This was used both for straight movement and turns. The protractery edgy end of the maneuvery tooly thingy (yeah, words is tough when writing at 3 am) shows a number between 1 and 6. When making a turn check which number the arrow is pointing at and then roll that many dice. NOTE: Rolling six dice + two more dice for going fast is bad. Don't do what I did. Some of the vehicle component cards can help here -- a spoiler, for example, allows you to ignore one "skid" result -- and I suggest you take some of those gadgets if you plan to twist and turn and spin all across the event. Our entire playtest session was one hour for two cars, with close to 30 minutes of our hour spent discussing the game and expected component costs. Actual play, including vehicle design, was in the 35 to 40 minute range . . . just slightly longer than our target. Fortunately, the actual play didn't feel like it was taking more than half an hour. So perceptions aligned neatly with our goal, even if the reality of time didn't match our goal. We'll work on that. During this session, Scott and I were testing his rough component mix for the two-player introductory game. This rendition of the game, if it happens as currently conceived, would be an inexpensive introduction to Car Wars; everything is looking like the deeper box that supports four players (and have a lot more vehicle design options) will require a price point higher than our $25 to $30 goal. So we adapt. And Scott's doing an excellent job of adapting . . . especially considering his very first draft of the new edition led us to a $100 game. Not quite the target price. More playtesting. Scott is taking the feedback from yesterday's game and making minor tweaks to his playtest set. Next week we're scheduled for two sessions -- with more players -- and I can see we're close to shifting our playtesting efforts from internal testing to public testing at stores and conventions. Will we run Car Wars playtests at Gen Con? Doubtful. I hope to have a set with me for private tests with select distributors and retailers, but things aren't quite at the point we're ready to open everything to a public playtest in the booth. That doesn't mean I won't be convinced that I should run a playtest or two in an undisclosed location for special friends, but don't expect to see the game in our booth. Siku have a range of 1:87 cars and are available on the Amazon UK site. Plenty more manufacturers out there. They just announced a delay until esrly 2017. Playtesting was positive but game time was 90-120min, and they're hoping to tweak it down 60min. Well, that will give my funds some time to recoup. Glad they are really putting some effort into playtesting, though. Never got into car wars,but now feeling the need to build all the cars from twisted metal video game and scale sized maps . I'm a bit excited about modeling an HO scale post apocalyptic race track.